Warning sign at a clinic in Washington state, where they are also having an outbreak. Japan is also fighting a major measles outbreak, even as a new study suggests that vaccine skepticism may correlate with votes for populists. Great! Everything is very reassuring. More than half of the cases in Mie involved members of the religious group Kyusei Shinkyo who had attended a workshop late last year. The group believes that medicines are “harmful” and advocates purification of the body and spirit. It later apologised for the outbreak on its website and said it was cooperating with health authorities. 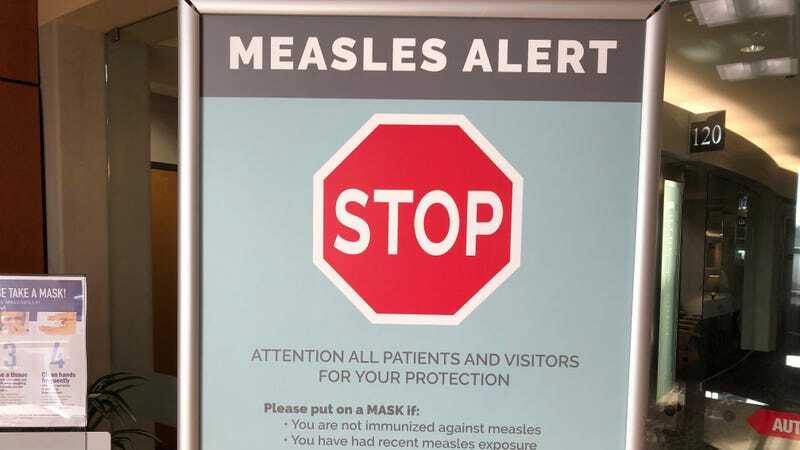 Big surges in the number of measles cases and deaths map to countries where populist parties have become prominent – in particular, Greece, Italy and France. The paper, in the European Journal of Public Health, says there is an underlying link between anti-establishment politics and vaccine hesitancy. “It seems likely that scientific populism is driven by similar feelings to political populism – ie profound distrust of elites and experts by disenfranchised and marginalised parts of the population,” writes the author, Jonathan Kennedy from Queen Mary University of London. Cool century we’ve got shaping up here!